Our kids learn from what we say and do. Don’t we all want to be the kind of sports parent that teaches good sportsmanship, teamwork and respect? Here is some simple advice on how to be the best sports parent before, during and after the game. Make them get their stuff together. It’s important for kids to learn to know what to bring to play their sport. As a parent, you can always do the quick check to make sure they did it correctly (don’t need any baseball bats at soccer), but tell them to go get ready and grab their stuff. Get them to the game on time. Most of our coaches ask for players to arrive 45 minutes before the game starts. This allows for a proper amount of time to warm up, talk about the game plan, etc. Showing up late can result in a rushed warm up (and potential injuries as a result), a distraction to the team and a lesson to your child that being late is OK. The kids on our older teams who drive themselves and show up late are generally the same kids whose parents were dropping them off late before the kids started driving. Teaching them punctuality early is super valuable as they get older—think about things like their college classes, job interviews, etc. Do not give them any advice, coaching tips or rewards offers tied to results. 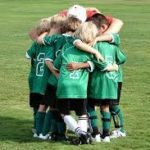 While many parents played their children’s game and understand it, what you tell them may conflict with what the coach is teaching and can be confusing for the child. Please don’t offer results-based rewards (you get $20 if you score today, you get ice cream if you take 5 shots, etc.). I’ve seen this time and time again throughout the years, and it is so detrimental to the player for that game. It gets in their head that they have to do that or anything else will be a failure. They focus only on that goal and generally play poorly overall. Six or seven years ago, I had a dad promise his daughter $50 if she scored in the soccer game. The problem was that it was her turn to play defense that game. Every time the ball came to her, she kept kicking it as hard as she could forward and then apologizing to the team. Finally, in the second half during her time out as a substitute, she told me about it, and it all made sense why I had a 10-year-old girl trying to shoot over and over from her own half of the field and then apologizing because she knew that wasn’t how the team was coached to play (she just wanted that $50 bill!). In that brief moment, as you are dropping them off with their team, have those final few words be a sign of support. Let them know you are looking forward to watching them play, and that you’ll see them after the game. If you’re at a game and want to be the best parent you can be, your one mission is to clap and cheer when the players give 100 percent effort. Sometimes that’s going to lead to a great play, and sometimes it’s going to lead to a horrible mistake. The support should be consistent—not waver up and down with how the result is going. If you can’t be 100 percent supportive, watch the game from a distance. Some of us are very emotional people and get really into the game and may let out some groans. 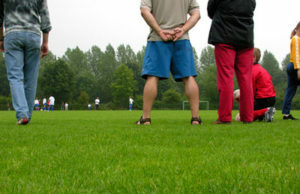 If you know that is you, find a nice spot 30 to 50 yards away from the sideline, so you can still watch and be supportive by being there but without letting the kids hear the groans. Parents should never coach from the sideline (that includes things as simple as “Shoot!” or “Get to it!”). Research shows that parents coaching from the sideline can be a very negative influence on the development (and enjoyment) of a player. Players can become confused hearing multiple voices (their coach and their parent), they can become accustomed to and reliant on acting only when they hear the voice of their parent, and they can become very nervous—and in some cases, fearful—of making mistakes. The game is the opportunity for our players to test out their skills. They should be taking risks. They should be making mistakes at times. Making mistakes is part of the learning and development process. If parents are supporting the players through taking risks and making mistakes, it will give the players the confidence to want to continue trying until they experience success. Never yell at a referee, opposing coach, opposing parent and especially not an opposing player. None of this ever goes well. There will be referees who are horrible. That’s life. Some people are good at what they do and some aren’t. If your waiter gets your order wrong, would you ever stand up and start yelling at them in front of the restaurant “Come on! Are you kidding me? Does that look like a filet mignon? !” Youth soccer referees are either volunteers or not getting paid enough to put up with people degrading them. I’ve seen it time and time again where referees (good ones, too!) quit because of one game where they were just berated. If the issue is the referee not understanding the rules or not protecting the players, please let our coaches handle that. I can’t tell you how many times over the years I’ve had parents come up to me after games complaining about the referees when I thought the referees were fantastic. There are also going to be teams out there who play an overly physical brand of soccer, which is going to result in some hard tackles. Parents yelling at the opponents (particularly the opposing players) is not going to help things. Every time I have ever seen this happen, it makes things 10 times worse immediately because it adds more intensity to the game and players come in harder and faster. You are the parents of our players and should help set the right example for them. If you are respectful and supportive, the kids will respond that way. If the kids see their parents screaming at the refs, they’ll think they should be doing that as well. Don’t give them commentary about what they did right or wrong. Don’t question anything the coach, referee, opponents, or their teammates did. Do be consistent with how you approach them after each game regardless of the result. After a game ends is by far the most important moment you have with your kid in their soccer career. I’ve seen kids quit soccer because they feared Coach Dad’s feedback on the car ride home. I’ve seen kids excel because their parents were consistent and positive after all games where the kids understood the value of playing and not just of winning. The kids are smart. They typically know exactly how they did in that game individually and as a team. The coaches will generally give a little post-game feedback as well, so that area is covered. Telling your kid that you love to watch them play and how much fun it was to come is all you need to do. It shows that you support them, support their team and support the sport they have chosen to play. Be consistent with this post-game interaction! If the team wins 6-0, don’t get overly pumped up and excited unless you plan to be that way when they lose 6-0 as well. One of the common suggestion points in articles about this topic is to go get ice cream after the game—that will fix everything, right? While ice cream certainly can fix a lot of things, make sure it’s consistent. Don’t connect it or any other potential post-game reward/fun to winning and losing (i.e. you get ice cream if you win and if you get crushed). Support the coach as well. How you treat the coach carries over to your player without question. The parents who are visually supportive of the team and coach generally are the parents of the most coachable kids. One of the best examples is a fantastic family we have in my club, Eclipse. The player has bounced between teams in his age group over the past five years. His mom has been consistently supportive of her son, his teammates and his coaches from Day One of Eclipse (with all of those things changing year after year, as he moved between teams). Her son is arguably the most coachable kid in the entire club. He respects everyone around him, interacts with all of the coaches in the club to soak up as much knowledge as he can, and has developed an unbelievable amount over these five years. There are a ton of great examples like this throughout the club. Make sure you and your child are one of those great examples. If everyone respects each other and works together, great things can happen. Shane Carney founded East Bay Eclipse Soccer Club, a TeamSnap customer, in 2010 and has been the director since its inception. 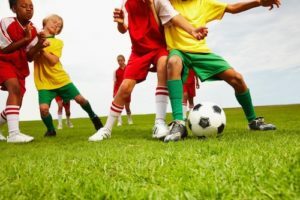 He has 14 years experience coaching youth club soccer players and has received more than 40 certifications in the areas of coaching soccer, child development and player safety.